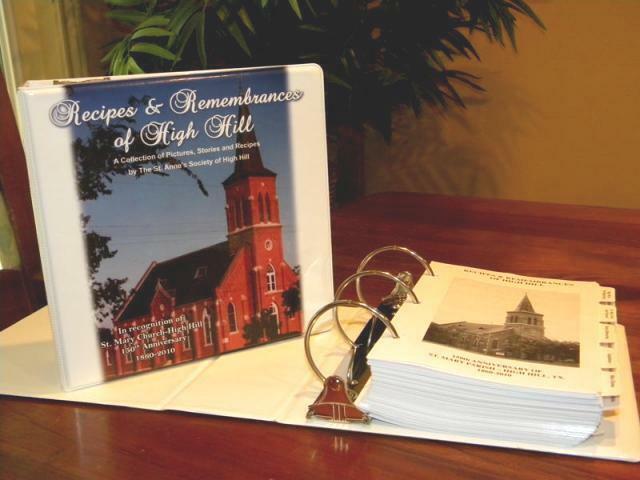 In honor of St. Mary's 150th anniversary (1860-2010), we collected "old family recipes," as well as family histories, stories, and pictures, and compiled them all into one book. We advertised in newspapers, made a lot of phone calls, sent e-mails, etc. and after many months and a lot of cooperation, we are pleased to present this book: "Recipes & Remembrances of High Hil: A Collection of Pictures, Stories and Recipes." The book will be on sale at the souvenir booth at our annual parish picnic in September and will be sold at local businesses, including The Flower Box, The Apothecary, Willie Joe's Processing Plant, Frank's Restaurant, and the Schulenburg Chamber of Commerce. The St. Anne's Society was founded in 1881 by Anna Wick as the St. Anne's Mother's Society. Today the St. Anne's Society functions as the altar society for the St. Mary Parish at High Hill. Members see that fresh flowers are on the altars and articles required to meet the needs of the priests are purchased. They also tend to linens and vestments. Members of the St. Anne's Society pray the rosary before each Saturday evening mass and at funeral masses/rosaries. They also help with the social following burials. The St. Anne's Society takes care of votives in the church and the sale of religious articles. They have one annual fundraiser, usually a plant sale and country store held in April.